The Warp Engine is a popular 68040 processor board that replaces the A3640. It includes four 72-pin SIMM sockets and a Fast SCSI-2 host adapter. 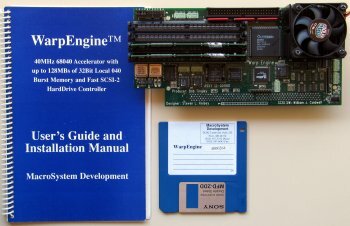 It may also have been sold without the processor with the intention being that the processor could be removed from your existing A3640 and fitted onto the Warpengine. Any combination of 4M, 8M, 16M, or 32M 72-pin SIMMs, either 32-bit or 36-bit wide. Add them starting with SIMM4 and working down to SIMM1. It is advised that you put your largest SIMM in the SIMM4 socket. EDO SIMMs may be used, but won't operate any faster than standard ones. For a 28 MHz Warp Engine, 80 ns SIMMs are adequate. A 33 MHz Warp Engine requires 70 ns SIMMs, while a 40 MHz board needs 60 ns. A wait state jumper enables the use of 70 ns SIMMs with 33 and 40 MHz boards (although there is a slight performance reduction). Single or double-sided SIMMs will work, although the double-sided 16M SIMM is not recommended due to high power consumption. All that is required to convert a 28 MHz Warp Engine into a 33 MHz or 40 MHz Warp Engine is to replace the oscillator and processor (although memory SIMMs slower than 60 ns may require jumpering jumper D to enable a wait state). On some variations of the Warp Engine, the 68040 may be soldered in place, making upgrades difficult at best. The WarpEngine also supports an 030 fall-back mode. Note, this mode probably only works if you also have an 030 on the motherboard, eg most A4000's don't. You can connect a switch to JP2 with the clock jumper set to internal to disable the RAM and on-board SCSI which may help with very old games. "There are two jumpers (the second and third pair of pins on JP2) that select the SIMM slot addressing. One of the jumpers controls whether or not any of the installed SIMMs are dual bank (i.e. 8 or 32 MB). The other jumper controls whether or not any of the SIMMs are 16 MB per bank (i.e. 16 or 32 MB). If the jumpers are set correctly and the SIMMs are installed in a reasonable order, most combinations of SIMMs will result in one contiguous block of memory. A few combinations will result in two or three noncontiguous blocks. The Warp Engine has no limitation on how you mix 4, 8, 16 and 32 MB SIMMs. You can put them in any order and you can set the size and dual bank jumpers any way you want. The automatic DRAM sizing routines figure it all out. But some combinations, while completely legal and functional, are not optimal. So, if you configure your Warp Engine properly, you should be able to get the best performance possible. If you have one or more 16 MB SIMMs (and possibly 1 or more 4 MB's), you should set the size jumper to 16/32 (off) and the dual bank jumper to single sided (on). Then, install your 16 MB SIMMs first, followed by any 4 MB SIMMs. This will make all the 16 MB SIMMs and the first 4 MB SIMM (if present) all one contiguous block. There are many other combinations that work in a similar way. There are also some combinations that will result in two or more chunks of memory. The thing to remember is that you should propperly set the jumpers according to the types of SIMMs you have, and then install them in a reasonable order."